God told Noah to build an ark before the flood came. He did, and the family of Noah was saved. God gave Moses 10 commandments to teach to the people. Those who follow the commandments were blessed. Noah, Moses, and other prophets found in the Bible were called by God to speak for Him. When they did, it was as if God was speaking. Members of The Church of Jesus Christ of Latter-day Saints believe God still speaks to us, His children, through prophets. Just like prophets found in the Bible and The Book of Mormon, additional scripture, today’s prophet is a witness of Jesus Christ. He testifies of the Savior’s divinity and teaches His gospel. He receives direction from God and often offers warnings in order to prepare us for what is to come. So who are these modern prophets? 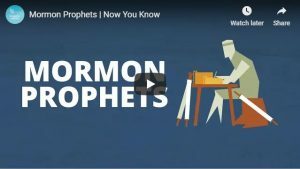 This video is part of the “Now You Know” series of videos from the Church that explain our basic beliefs.